Food Blogging For Dummies — A Giveaway! The only thing better than cooking and eating is talking about it. Combine your two loves–food and blogging–with this ultimate guide for food bloggers everywhere. Food Blogging For Dummies shows you how to join the blogosphere with your own food blog. This unique guide covers everything: how to identify your niche, design your site, find your voice, and create mouthwatering visuals of your best recipes and menus using dazzling lighting and effects. You’ll learn how to optimize your blog for search, connect with social media, take your blog mobile, add widgets, and much more. Here’s everything you need to know about food blogging. 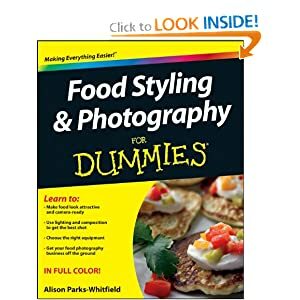 The second book is Food Styling and Photography For Dummies by Alison Parks-Whitfield. Food Blogging for Dummies includes a comprehensive section on “Eating with Your Eyes,” but if you want to learn even more about the food-photography business, this book is for you. It will teach you how to make food look attractive and camera-ready, how to use lighting and composition to get the best shot, how to choose the right equipment, and how to get your food photography business off the ground. I especially liked the styling, camera techniques, and photo management sections, including “Ten Awesome Garnishes for Food Images” (hint: one is the “double drizzle”). Third is Pinterest For Dummies by Kelby Carr. If you haven’t played around on Pinterest yet, you may not understand what all the talk is about. If you’re already on Pinterest, then you know just how much fun — and how distracting — this site can be. (You can check out Cooks&Books&Recipes on Pinterest here.) This “Dummies” books details what else you need to know: how to socialize on Pinterest, how to go mobile, how to control privacy, and how to self-promote, as well as offering etiquette rules and suggesting “power pinners,” including the food blogger Jaden Hair of Steamy Kitchen (I’m a longtime fan). Now that you want all three, here’s your chance to get one for free. Enter the giveaway, and if you win, it’s your choice: Cooks&Books&Recipes will send you whichever one of these books your heart desires. We’ll call it A Giveaway For Dummies — because it’s just that easy. Note: It’s not necessary to do all 6 entries. Choose whichever you like, and you’ll be entered in the giveaway. Now might also be a good time to announce that with this giveaway, we’re experimenting with the Rafflecopter entry method. Seems easier for you to enter and for us to use. I’d love to know what you think — please feel free to comment with your opinion. UPDATE: The winner was KathyH, who won with her Twitter follow entry. Congratulations, Kathy, and thanks to everyone for entering! This would be a BIG help to me, I’m in the middle of staring a food blog and have no clue what I’m doing! Help me!! I followed you on twitter and facebook.Â I would love a copy of the book. I would love food styling for dummies OR food blogging dummies! esp food styling though! How can I only choose one? okay fine, I will try! I love to cook for my family! I would love to have Pinterest for Dummies. I’ve wanted the “food blogging for dummies” book for a while now! It would be such an incredible resource to help me continue to grow my blog! I love all these books! I think I need all three books. I would love to start a food blog and have no idea how and of course to make it look good I would need the photography and Food Styling and I love Pinterest but have no idea how to really utilize it. I have figured out how to pin and follow but that is it. So please help!!!! Would love to win Food Blogging for Dummies! 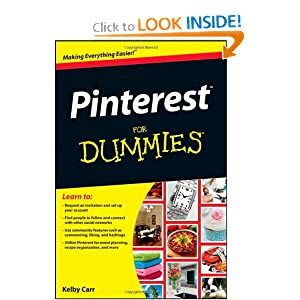 I would love to win a copy of Pinterest for Dummies! I can’t wait to read this book.Â I don’t know where to start! I just started using Pinterest and would love to win the Pinterest for Dummies to help me! Would love the food styling book! Looks great! It would be great because I want to start a food blog. I would like the food blogging one. I’d love the food blogging for dummies. Thank you for the giveaway.Â Any of these books would be very helpful. Would love the Pinterest book!